At Canningvale we offer the very best bed linen online, crafted from the finest raw materials available and subject to the strictest QA in the business. This collection of bedding and bedlinen focuses on ensuring you have the right foundations for a healthy restful night’s sleep, while never compromising on comfort and style. At Canningvale, we are continually expanding our bedding and bed linen offers with new products arriving throughout the year. Our collection now includes Sheet Sets, Microfibre Pillows, Blankets, Quilt Cover Sets, Mattress Toppers, Pillow Protectors with ranges and products to suit a variety of budgets and bedroom styles, from luxury through to the everyday. All of our bedding products have been carefully developed and tested to make sure you will enjoy top quality comfort, durability and support throughout the use of the product’s life. If you can’t make up your mind on what would suit your bedroom needs best, head on over to the Canningvale blog where you be able to read through various examples and stylish trends that might help you make that final decision. No matter what your final decision is, we are sure that you will love your new bedroom products for many years to come as Canningvale is fast becoming one of the best places to buy bedding online in Australia and bed linen online. 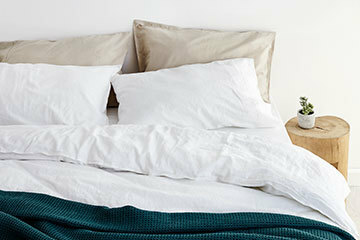 Like all of Canningvale's products, our bed linen and bedding covered by a 5-year manufacturing warranty.